Let's go have a beer,shall we? Is all this talk about beer making you thirsty? Let’s take a little trip down to the local public house, OK? The public house, or pub (yes, words were shortened before texting too) dates all the way back to the Romans. When the Roman road was created, it gave birth to roadside inns called tabernae. Fast-forward to the 1800s and the rise of “beer houses,” where within a year there were 400 and in eight years there were 46,000 of these new drinking establishments. 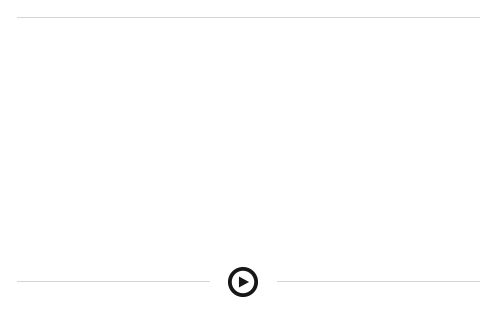 Now that’s going viral before viral was viral. These public houses were the cornerstone of communities, a place for people to convene, discuss and build camaraderie among citizens. 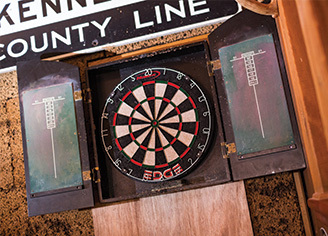 These pubs gained their greatest popularity in Britain, with notable Brit Samuel Pepys calling pubs “The heart of England.” They were, and still are, earmarked by their traditional English ales and distinctive wood décor. 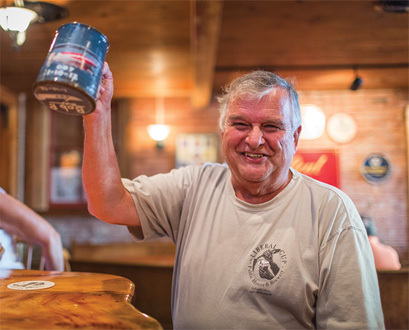 The public house tradition has made its way throughout the United States and is evident on Water Street in Hallowell, Maine, at a friendly establishment called The Liberal Cup. 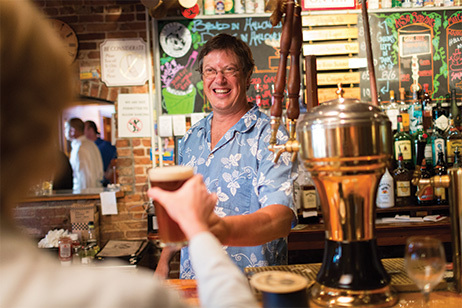 A combination brewpub and public house, The Liberal Cup is run by Geoff Houghton, a guy whose passion for making beer is equaled only by his desire to run a successful and popular pub. If you’re standing at the bar at The Liberal Cup, you need only look to your right, where about 20 feet away are the tanks, pulled from a British junkyard, that are brewing the beer you are drinking. “They’re not necessarily pretty, but very effective,” says Geoff. Because the brewing is so close to the bar, the customers become a part of the brewing process, sometimes giving Geoff instant feedback on a new batch. 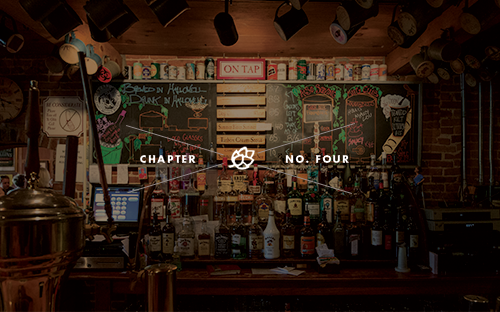 In fact, the customers are so connected to the brewing, the menu even shows how much of a certain brew is left. If you like a certain flavor, be it a Bug Lager, an Alewife Ale or the comically titled Ex-Wife Extra Bitter, better get some before it’s gone. Only a hop, skip and jump away from Maine’s capitol of Augusta, you might think The Liberal Cup is named due to its political affiliations. But nothing could be further from the truth. Geoff’s use of the word “liberal” has to do with the generous amount of beer you get in a single serving, with mugs serving an ample 25 ounces of homemade brew. Speaking of servings, if you look above the bar, you’ll see mugs of all different colors and styles hanging from the ceiling. They’re part of one of the great public house traditions carried on at The Liberal Cup: Mug Club. 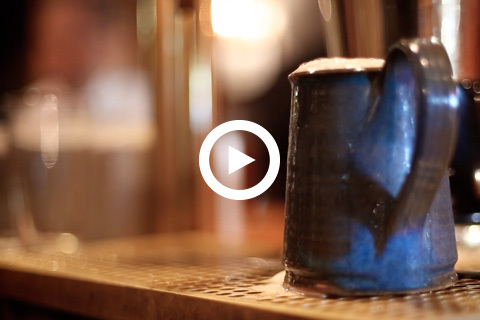 Do that, and a local artist will make you a personalized mug that will hang above the bar. Members are part of a select group of beer drinkers who share a common bond—you’ll routinely see Mug Club members saluting each other at the bar, clanking their signature mugs. 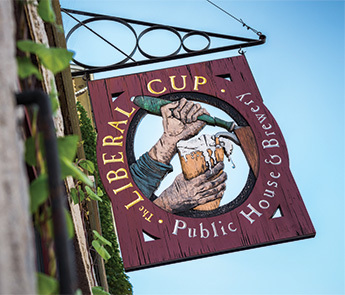 The Liberal Cup is one of those great discoveries people make as they travel through Maine. The vibe is exciting, and the fact that you get to have a beer you can’t get anywhere else adds to the excitement. 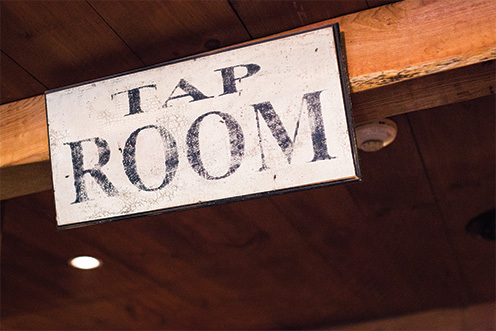 The brewing itself complements the energy … as Geoff says: “Every now and then a hose will break or a pump will explode, it just adds to the excitement for the customers.” Hey, it’s all safe and in the spirit of a traditional—yet distinctly Maine—public house.